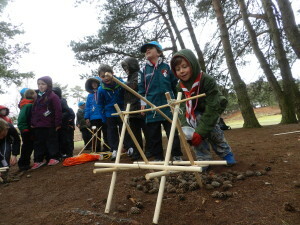 Beavers from across Poole visited Brownsea Island recently to learn about camping and to complete their Camp Craft activity badge. 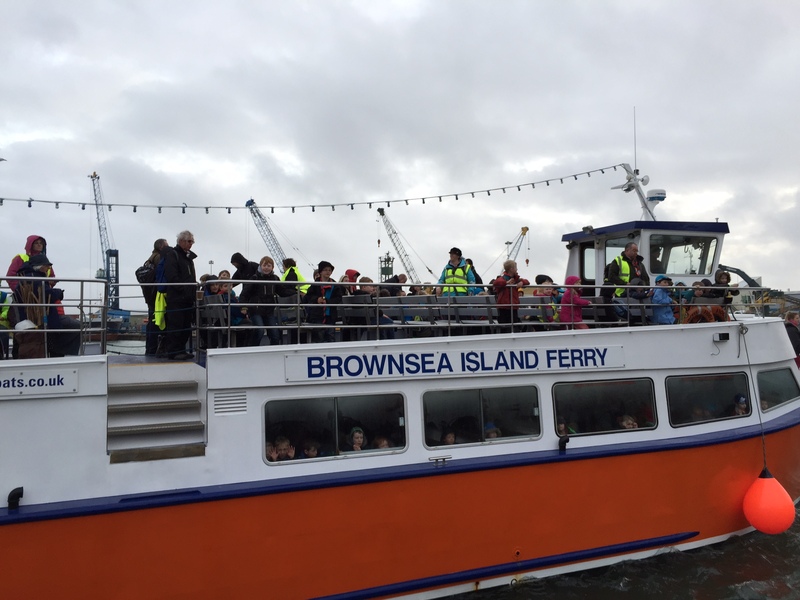 240 Beavers, Leaders and Parent helpers met at Poole Quay by the status of Lord Baden-Powell on a rather wet and windy Saturday morning for the boats to transport us over the Island to meet the Explorer Scouts who had camped overnight on the Island. 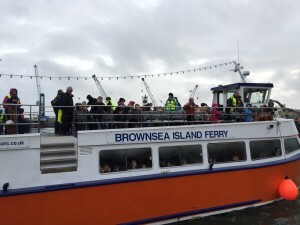 Once we got to the Island, the National Trust staff and Kevin, the District Commissioner for the Island, were there to greet us off the boats. The day was based in the same area of the first Scout Camp held by Lord Baden-Powell in 1907 and was split up into a range of activity bases, some involving team work and others requiring the Beavers to work on their own. Some of the activities and challenges included learning to tie the Reef Knot and Clove Hitch so that it could be used as part of the pioneering project, erecting and dismantling a tent, shelter building, scavenger hunts, orienteering & fire building. On the pioneering base the Beavers had to work as pairs and use the knots they were taught to start to make an a-frame so they could how it could be put to use. Akela and his team, who came with us to help us on this element, then demonstrated as a completed baluster of which the Beavers were able to use to fire the fir cones from it to a target. At the next base the beavers had to work together as a team to erect and dismantle a tent. The weather was not really ideal for this, as the wind was coming off the sea in a southerly direction. Despite this the Beavers we working really hard communicating with each other to make sure the tent did not blow away! In the background the Explorers Camp was also taking quite a battering. In the trees looking outwards the Purbecks we did some shelter building and learnt how to build a fire correctly. The shelter proved to provide some respite from the weather and became the largest shelter we have ever seen! The Beavers also visited a scavenger hunt come orienteering base as well, which lead on to the Trade Post and learning about the Scouting History and a bit more about the first Scout Camp in 1907. The Beavers had to locate some postcards of images around the trade post area and discuss what they saw, complete a quiz relating to the Scouting History information boards and visit the trade post to look at the different badges and neckerchiefs that they have on display. On leaving the base they all received the latest Brownsea Island blanket badge to start a camp blanket. Having learnt how to build a fire, the Beavers then visited the camp fire circle where they were able to toast marshmallows and made bread twists on an open fire. This was the first time the camp fire circle had a real fire burning in it. To end the day we all headed to the Scout Stone for a group photograph and then enjoyed a slow walk back to the church field where certificates were handed out to all to say they had completed the Camp Craft activity badge. We would like to say a big thank you to all who made the day so special and great to see the Beavers enjoying it so much. One Beaver when asked if he liked it said “No… I absolutely loved it!” and another described it as the “Best Day Ever”.